We just celebrated our one year anniversary of moving into this home! 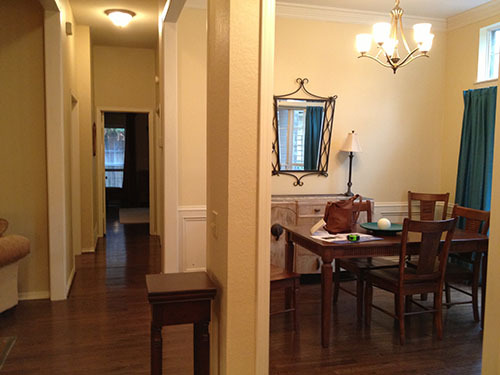 I thought it would be fun to compare how the house has changed in the year since we moved in, space by space. We made some small changes in here that have had a big impact. 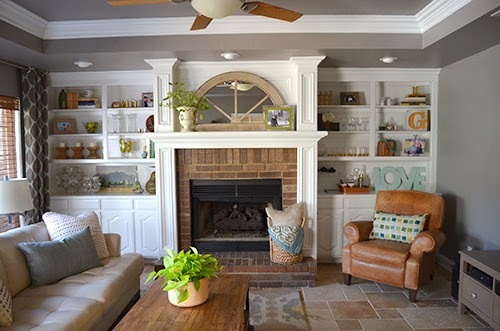 We painted the walls Revere Pewter by Benjamin Moore and freshened up the crown moulding and wainscotting with Pure White by Sherwin Williams. Then we hung our $15 thrift store lantern, which really made the space. It's large and in charge! 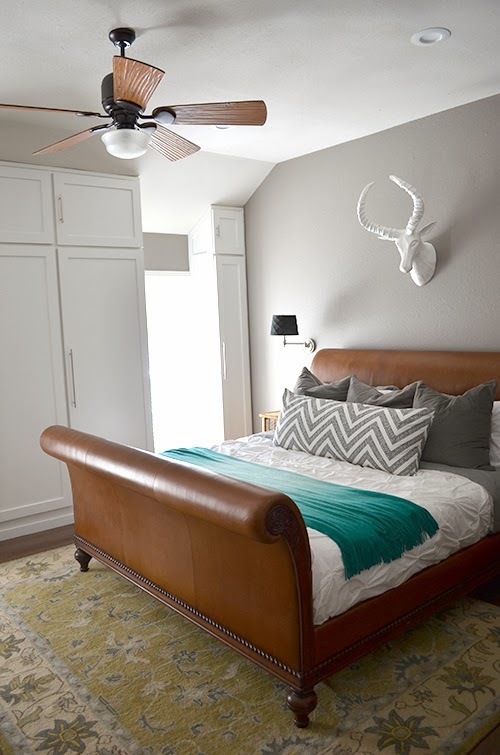 We spray painted the existing ceiling medallion oil-rubbed bronze, which makes our thrifted light look fancier. The floor-to-ceiling curtains are from Ikea, and we installed our own furniture (shelf, Wisteria; table, thrifted; chairs, World Market) to personalize it even more. 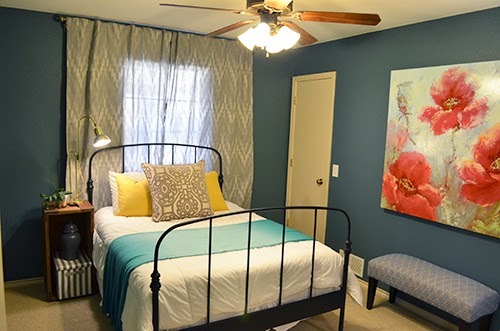 This room also got freshened up with new paint (walls: Revere Pewter, Benjamin Moore; trim: Pure White, Sherwin Williams). 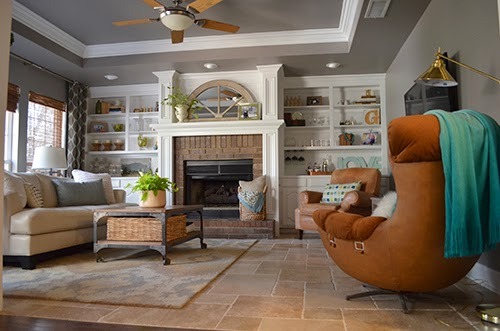 We installed 4 new recessed lights and two wall sconces because this was the darkest room in the house, with the only light coming from the dim ceiling fan. 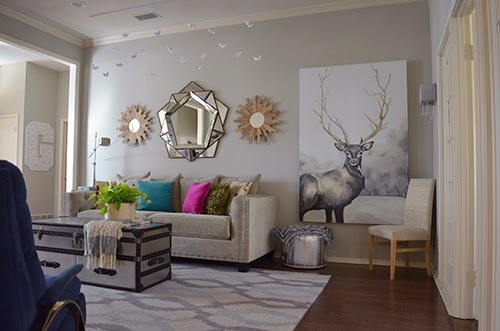 We added personality with my deer painting and pear painting, plus the DIY orgami mobile above the sofa. 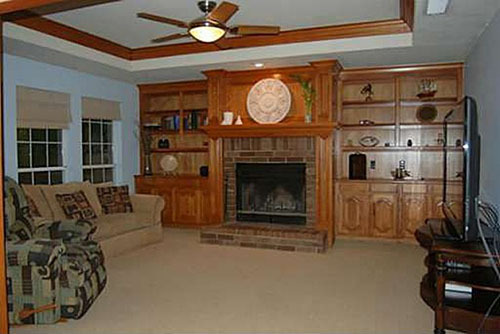 And of course, using our own furniture gives the room a completely different feel. 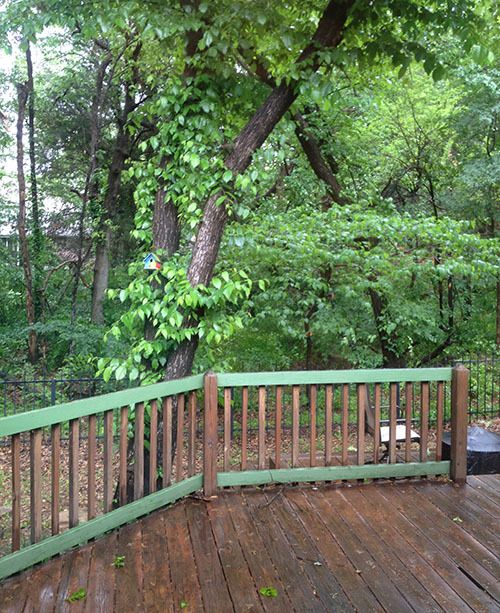 Just beyond the french doors is my office/art studio, which the previous owners used as a play room. Adjacent to the office is our kitchen. 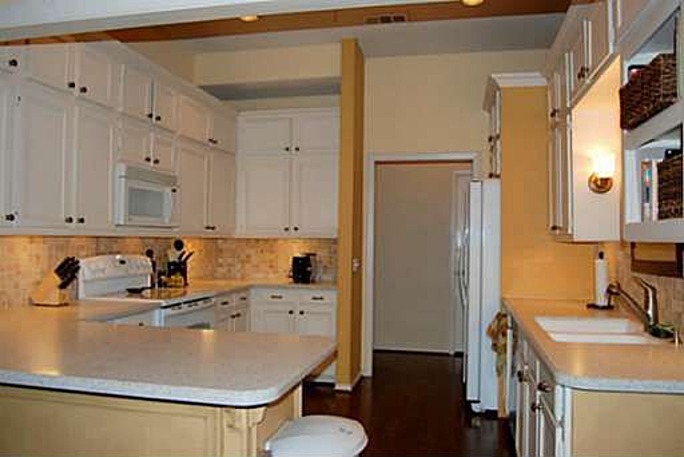 Apparently the previous owners liked yellow, since they used three different shades in this one room! 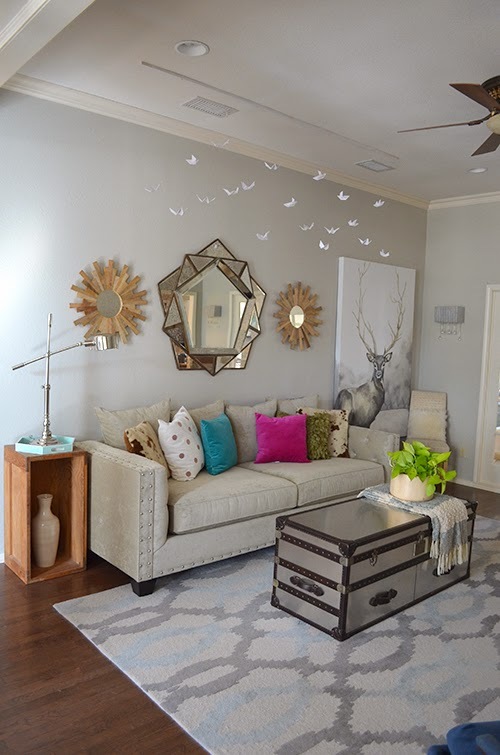 We just finished up this room, and we are in love. 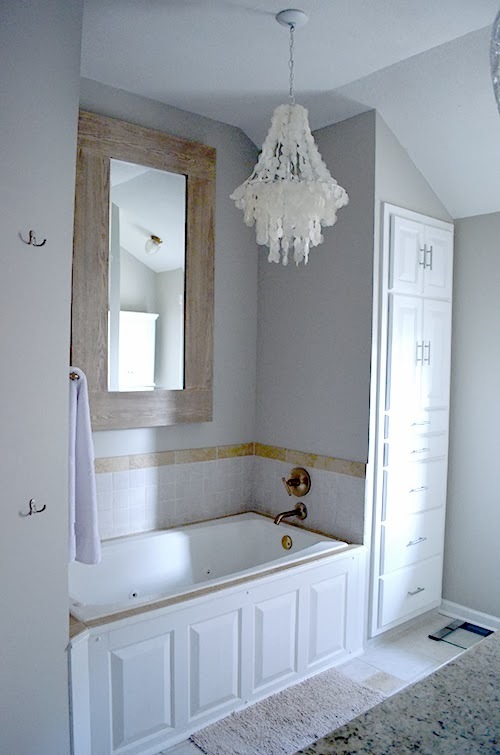 Our first step was to repaint the walls with our favorite neutral color, Revere Pewter by Benjamin Moore. We've also painted the cabinets (Pure White by Benjamin Moore), added some glass doors and dark cabinet backs (Valspar Hematite), and installed new cabinet hardware. 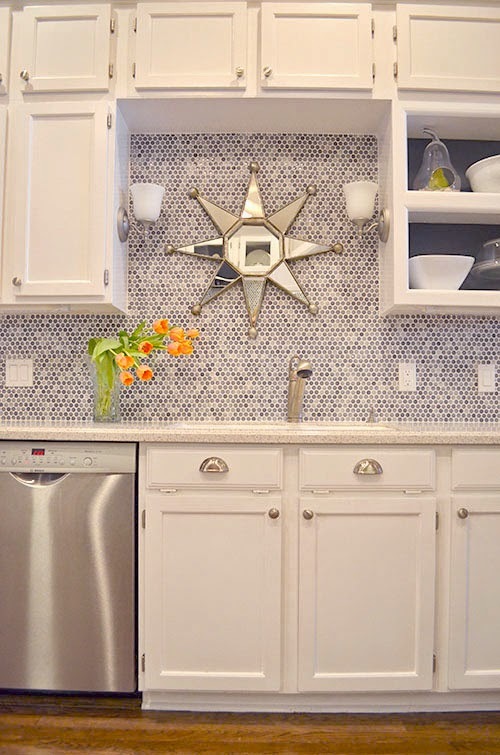 We brought in stainless steel appliances and installed a new backsplash. Lastly, we added more recessed lighting to brighten up the space even more. 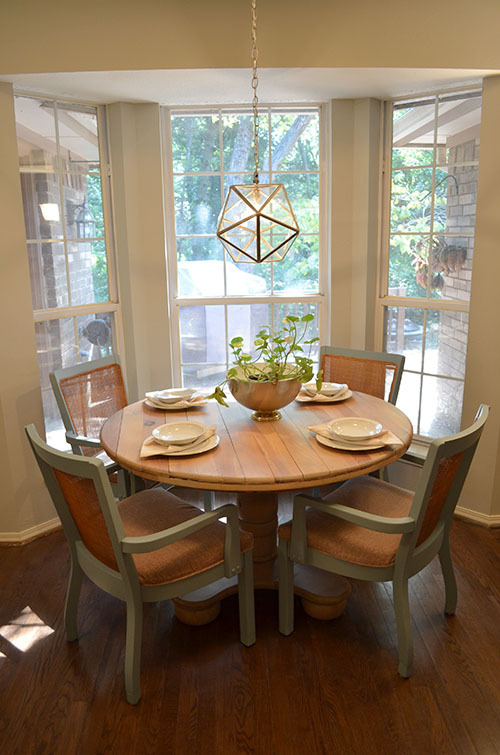 In the eat-in area of the kitchen, we installed a new geometric light we picked up at the flea market along with a rustic pedestal table (also a flea market find) that was freshened up with a new stain. The chairs are thrift store specials we painted a dusty blue. 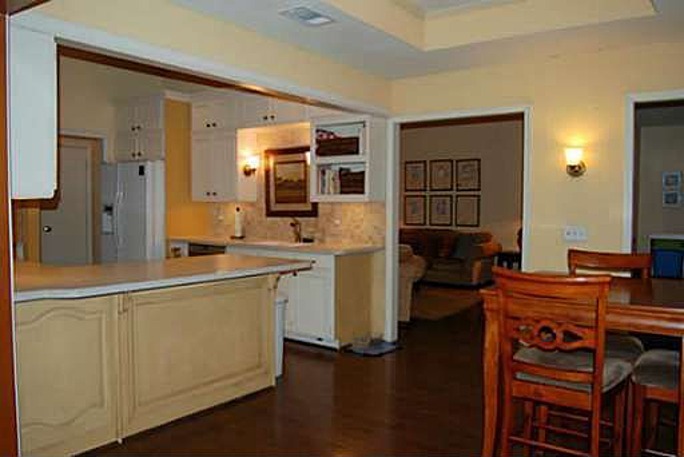 The kitchen looks into the den, which has probably undergone the most dramatic makeover of any room in the house. 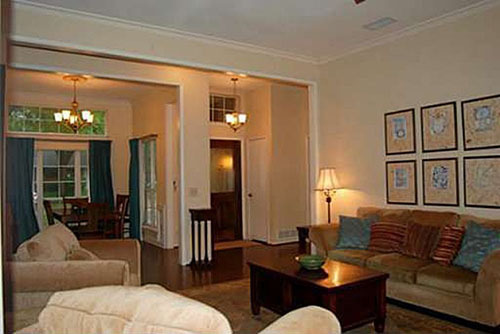 When we bought the house, the walls were baby blue and the built-ins were in their original oak finish. 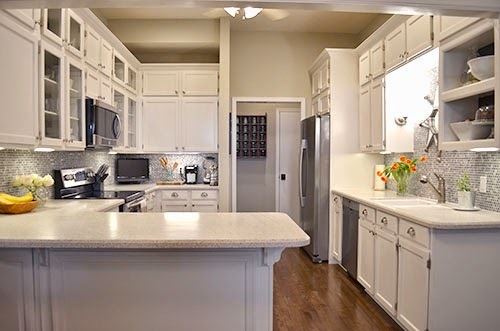 One of the very first things we did was paint those cabinets and crown moulding bright white (Pure White, Sherwin Williams). 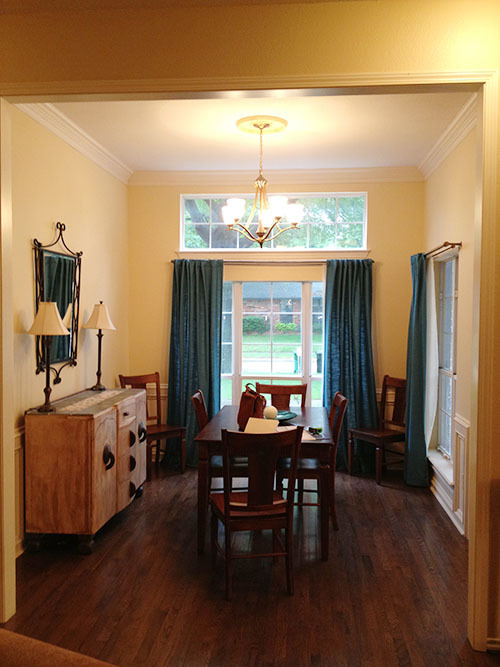 The baby blue walls got painted Galveston Gray by Benjamin Moore. It took us six months to decide that we couldn't take the carpet anymore (dogs + carpet = disaster), so we replaced that with travertine. 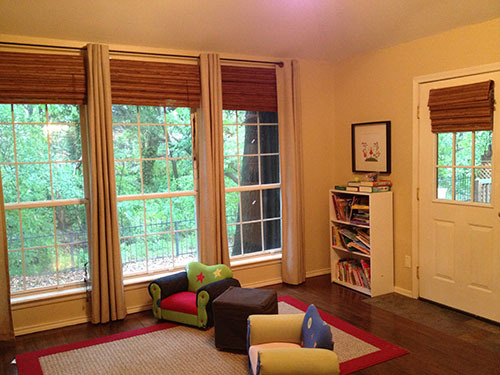 The windows received bamboo window shades transplanted from another room and my favorite West Elm curtains. The husband also installed some new spotlights in front of the built-ins to add to the ambience, plus we upgraded to thicker baseboards. We spend the majority of our time in this room, and it's such a cozy space now. It wins my "most improved" award! 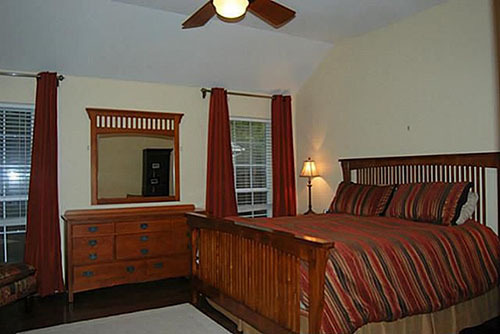 Our master bedroom is another space that has received a lot of attention since we moved in. 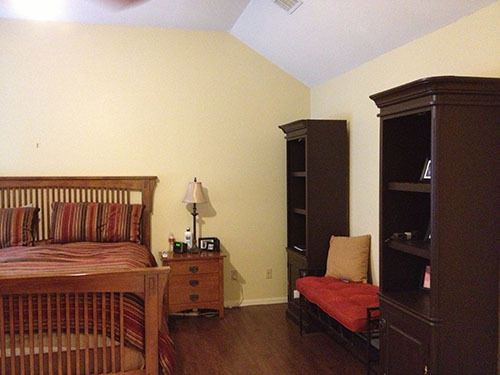 It was a perfectly nice room, but we didn't like the wall color and the lack of closet space was a big problem. 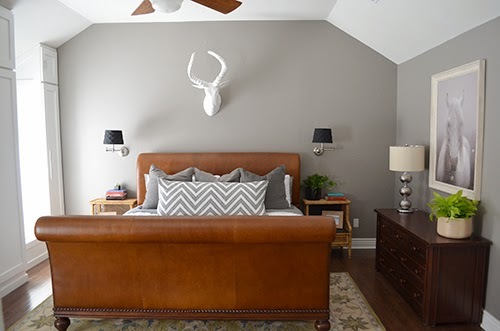 We wanted this room to feel cozy, so we went with a darker grey – Galveston Gray by Benjamin Moore – on the walls. 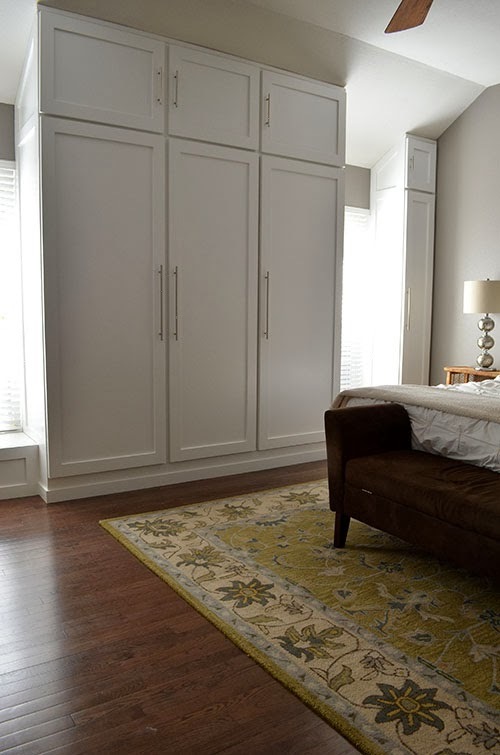 The husband tackled an extremely ambitious carpentry project to build himself custom closets, and they turned out beautifully. 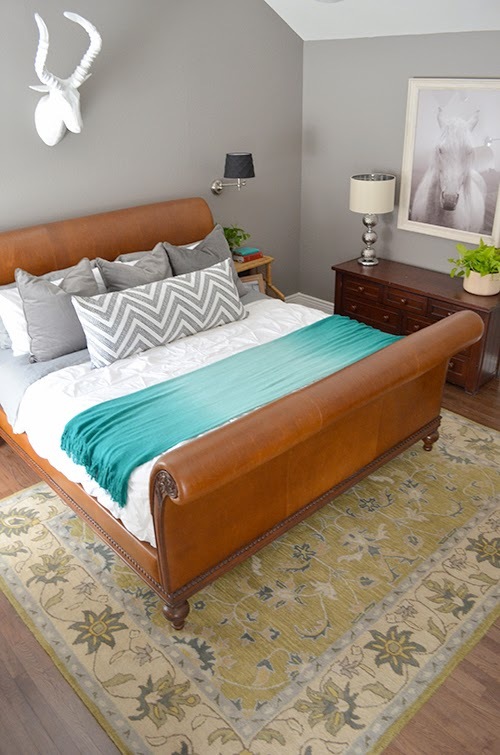 Then we found this amazing leather bed on Craigslist, which adds a lot to the room. 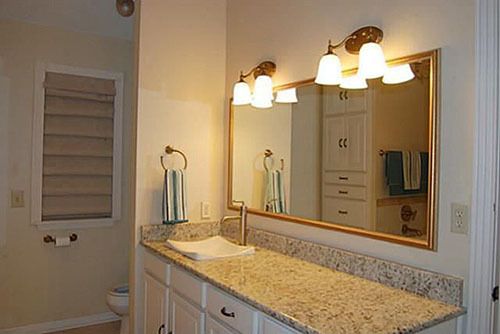 Smaller, less visible changes include installing bedside sconces and adding four recessed lights. The husband is all about adding more lights, and I'm not complaining! I love having a personal electrician. 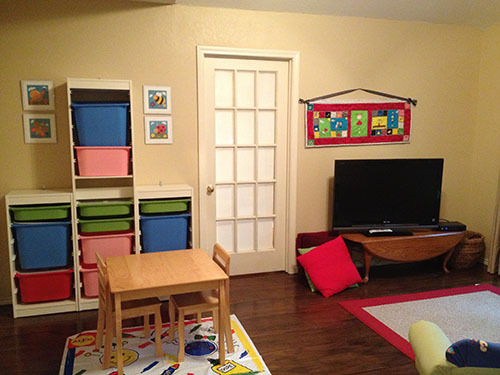 We also upgraded the baseboards in this room, which makes it feel more custom and high-end. 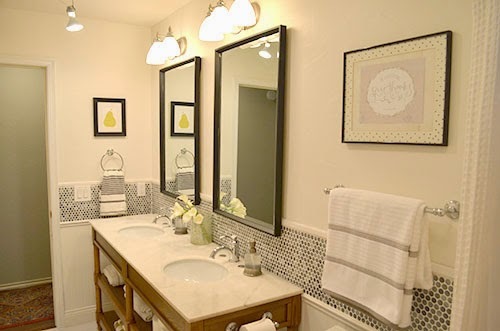 Our master bathroom got a budget friendly makeover a few months ago. It was perfectly nice to begin with, but we wanted to add our own flair. 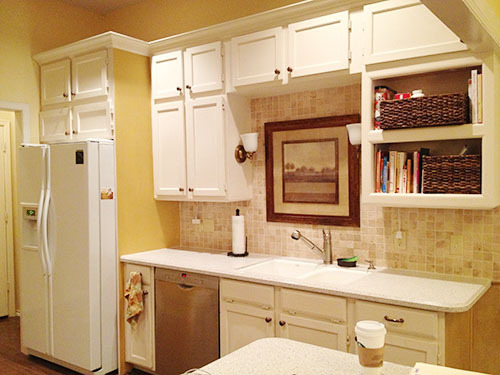 We painted the cabinetry (Pure White, Sherwin Williams) and the walls (Revere Pewter, Benjamin Moore). Above the tub we hung a giant mirror from Home Goods and a capiz chandelier that we picked up at the Pottery Barn outlet. 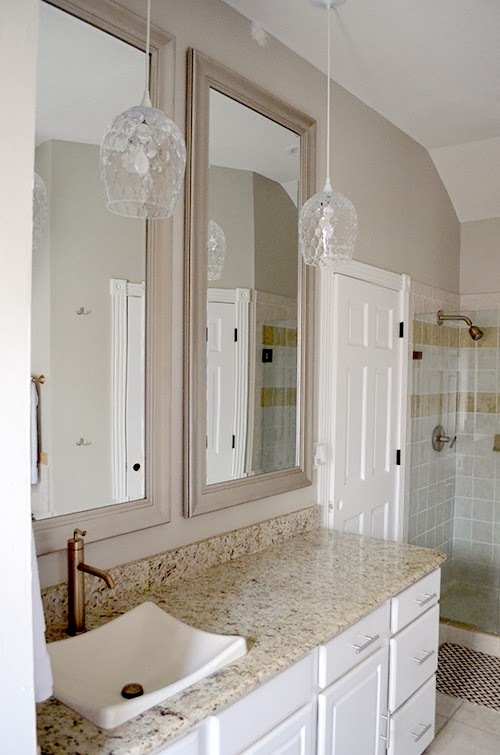 We wanted to emphasize the height of the ceilings in here, so we put two floor mirrors above the sink area and made our own DIY pendant lights from two glass vases. 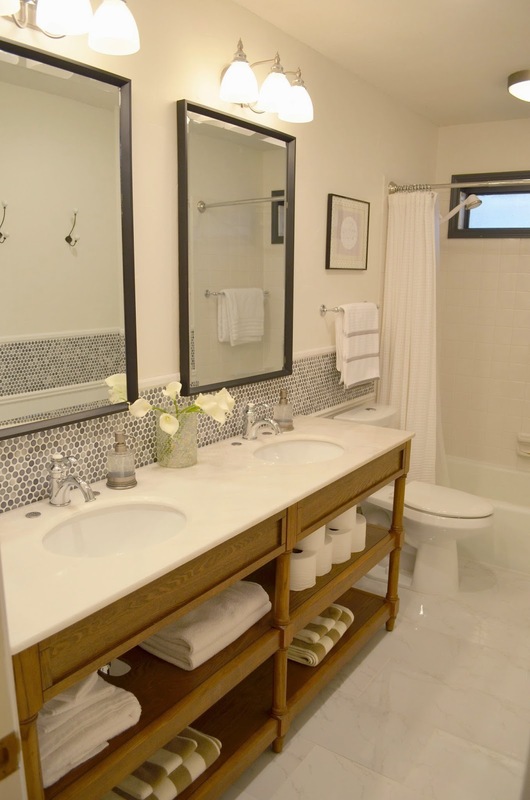 Lastly, we switched out the hardware to match the sleek faucets that were already in place and to tie in with the hardware we used on the built-in closets in the master bedroom. 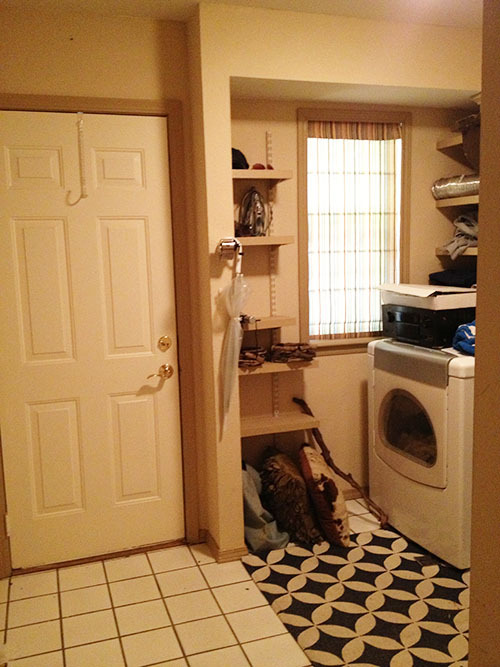 Just outside the master bedroom is our laundry room, which was one of the worst spots in the house when we moved in. 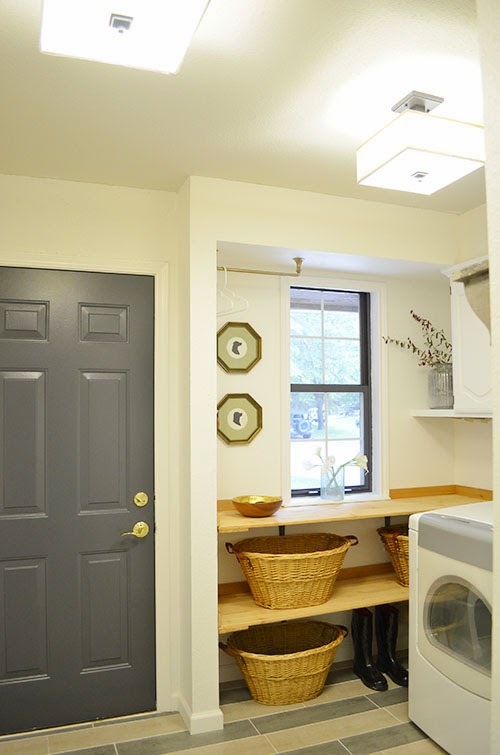 You might think, "Who cares, it's just a laundry room." I would be inclined to agree with you except that this is our main entrance to the house (through the garage) and we had to see this junky space so many times every day. That got old quickly. 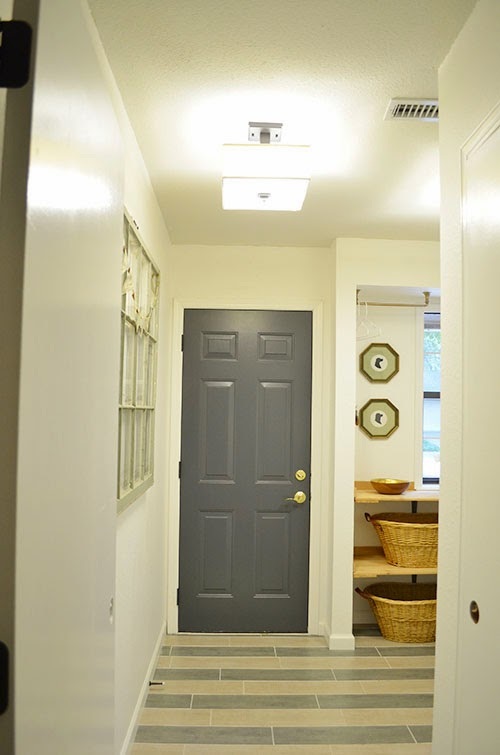 We painted the walls and cabinets white and the door/window a darker grey, Valspar Hematite. The husband built some cedar shelves under the window. The floors got some new striped tile for a little pizzazz. Full laundry room details available here. Now we'll hop over to the other wing of the house. 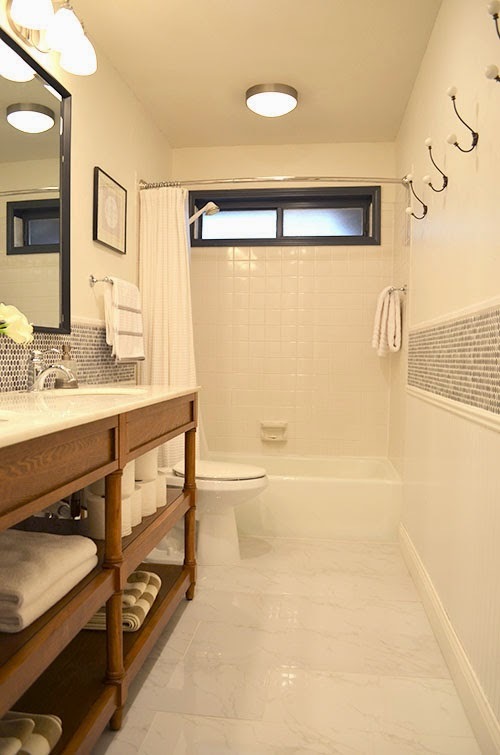 We have pretty much ignored this side except for a few major projects we recently finished, like our guest bathroom makeover. 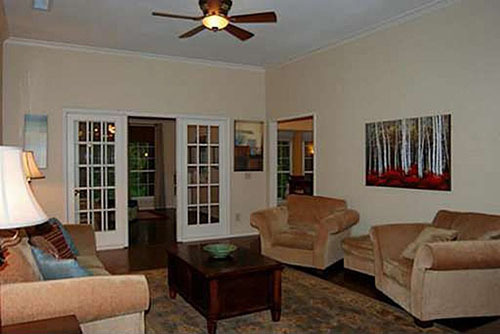 This room was all original and left a lot to be desired. 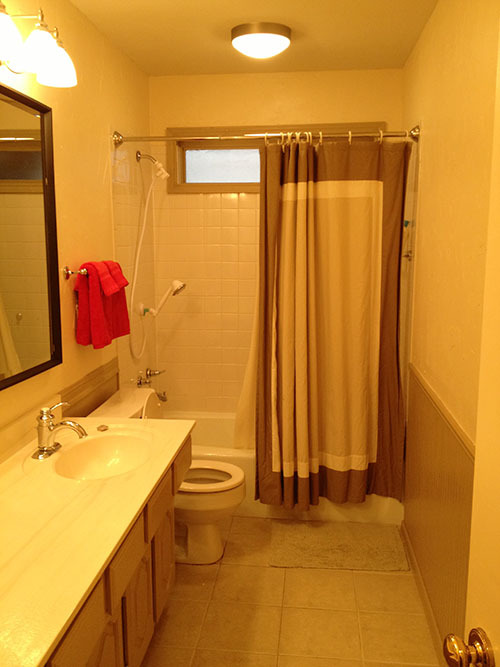 We painted the walls, installed a new vanity, added more beadboard, tiled the floors, installed a backsplash and upgraded to a new, taller toilet. The plumbing got a makeover with shiny chrome pipes, and we installed a new ceiling vent, along with two more recessed lights. 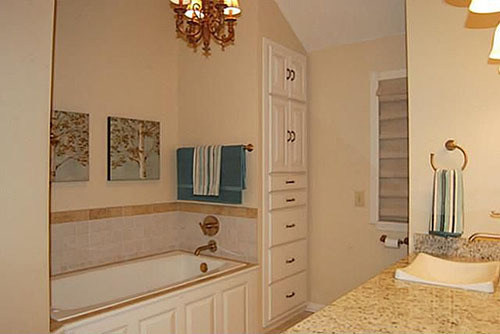 This room was really dark, and the recessed lights are a huge help. Full details on this makeover available here. 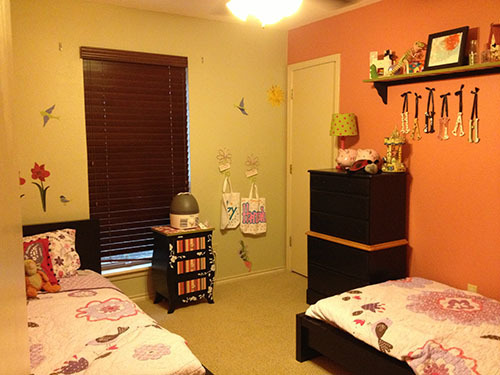 You may remember that we had a bright pink and green guest room when we first moved in. Obviously, that had to go! 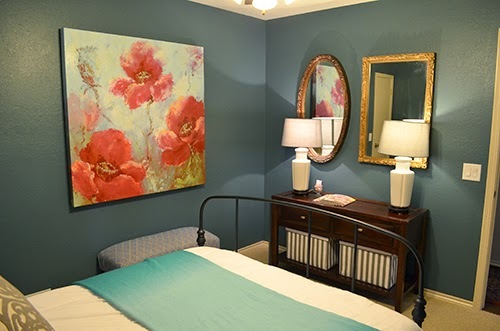 I went with a bold dark teal wall color in here and added our own furniture, but we still need to finish this room. The trim and doors need to be painted bright white, and we'll be upgrading the baseboards to match the rest of the house. I'm sure we'll discover more tasks along the way, but those are some of the major ones on our list. The good news is that the husband only has one week of school left, so we're about to tackle some things on this to-do list. He's a home project machine in the summer! I'm excited about how far we've come in just one year and am looking forward to more projects in the coming year. Thanks to each of you for following along on the ride. It's so much more fun because we get to share it with you!